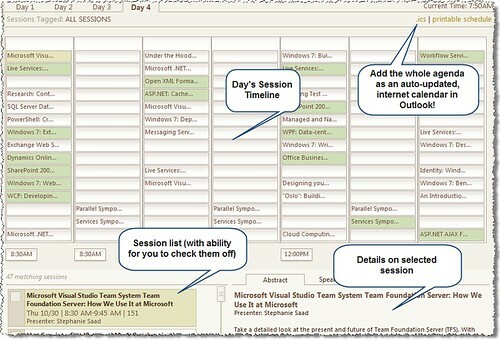 There's this cool timeline where you can see all sessions going on for a whole day in a matrix with the sessions you've selected colored in. Then you've got a list of all the sessions that day at the bottom (where you can also select them) and see their details. But what's really cool is the .ICS link at the top where you can add the entire agenda as an auto-updating Internet calendar in Outlook! Sweet!